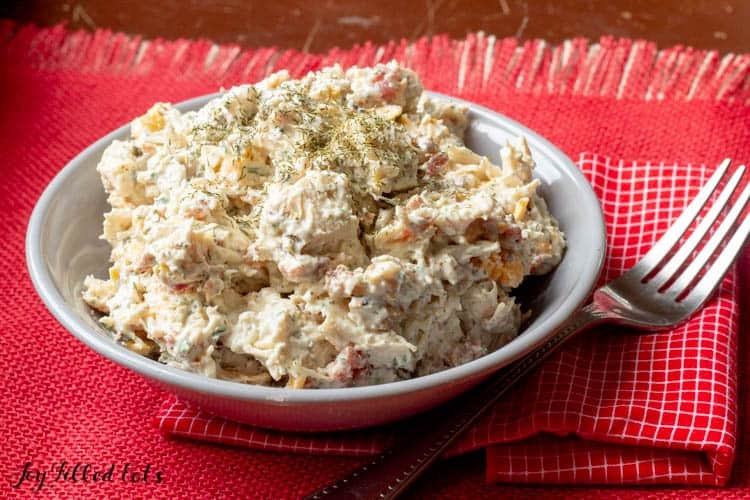 My Bacon Ranch Easy Chicken Salad is bursting with flavor. It is rich and creamy with cheddar, bacon, and dill. 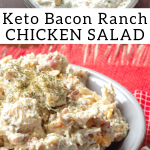 This is the BEST keto chicken salad you will ever eat. We love my Bacon Ranch Chicken Casserole so much that I needed to come up with a version for the warmer weather. This chicken salad does the trick. 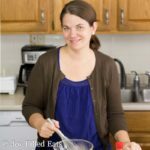 What type of chicken do I use for Keto Chicken Salad? 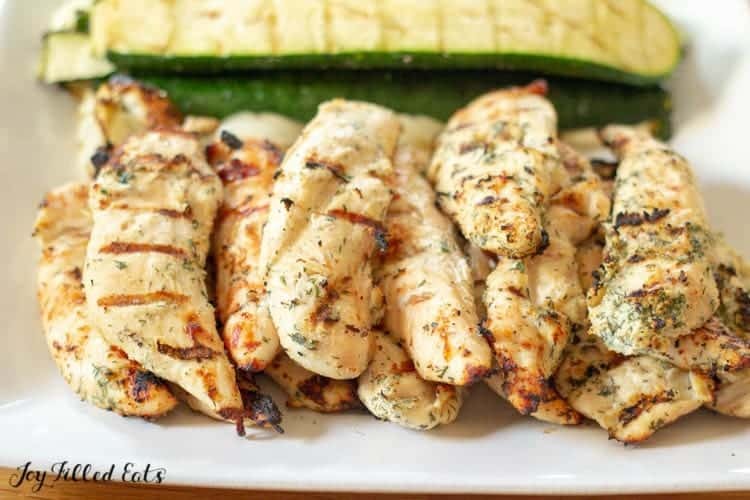 I use grilled chicken marinated in my Ranch Yogurt Marinade for this recipe for double the ranch flavor. I love ranch. Whenever we grill chicken I make enough to have leftovers for quick and easy lunches. 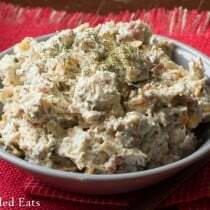 Chicken salad is one of our default summer meals. Any type of leftover cooked chicken is fine as long as it doesn’t have a contrasting flavor. I wouldn’t recommend using leftover chicken with an Asian marinade or spicy Mexican rub. This makes 2 servings of keto chicken salad. Feel free to double or triple to serve your entire family. I normally just make this for myself for lunch for a couple of days. Yes! 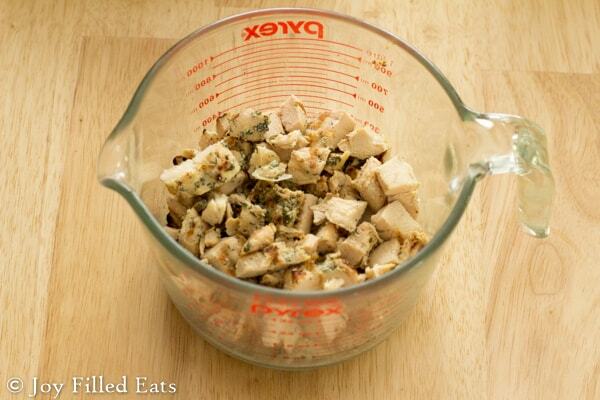 This is a great way to use up leftover chicken. 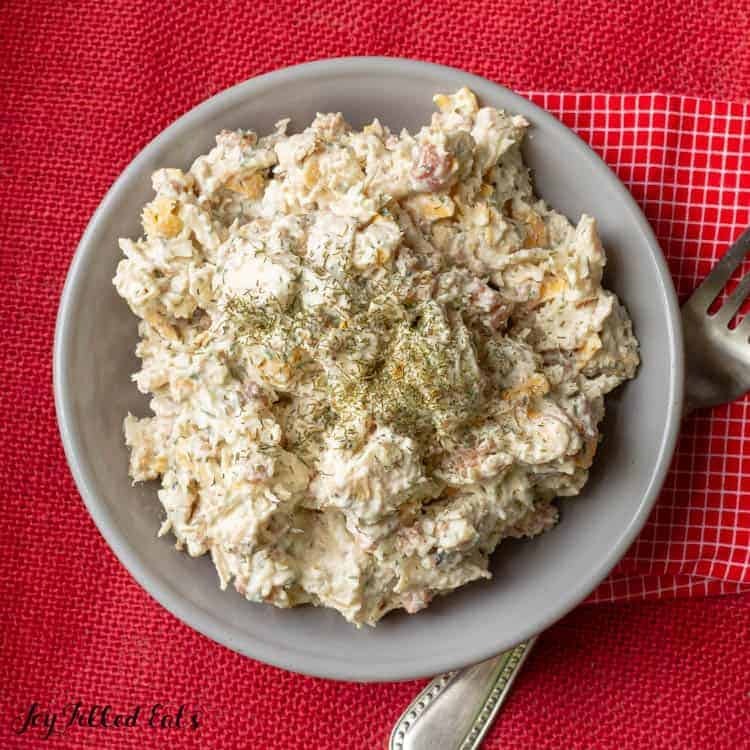 You can make this keto chicken salad with leftover rotisserie chicken or even canned chicken breast. If you use canned chicken breast just make sure to cut back on the salt or it might be too salty. Most days I eat leftovers from dinner for lunch. When it’s just me and my toddler I don’t feel like cooking another meal. But there are times I get tired of the leftover options. It is much easier to transform leftovers to have a different flavor or application than to make a whole new meal. 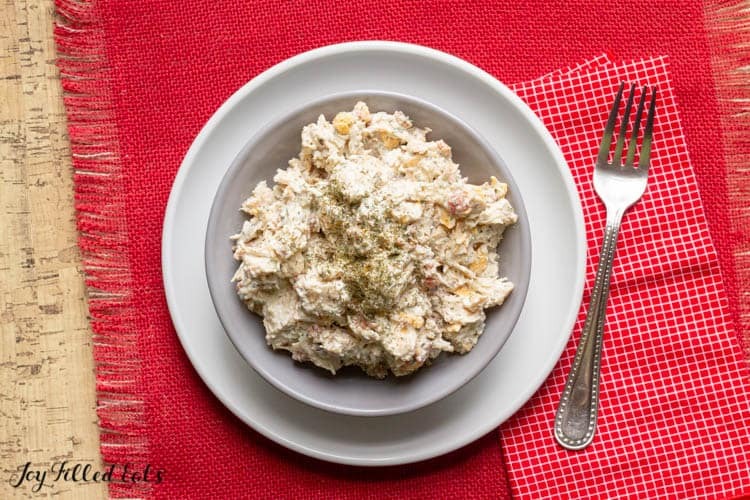 If you are looking for a lighter chicken salad using yogurt try this Healthy Chicken Salad. Chicken salad is great served with a fork. I tend to just eat it plain but other times I’ll put it inside a low carb tortilla, lettuce leaves, or serve it on top of baby spinach. If you have a low carb bread you like chicken salad sandwiches are delicious too. I get a lot of questions about my ranch recipes because I do not use bottled ranch dressing or ranch dressing packets. I use a specific blend of herbs and spices to create a ranch flavor from scratch! You do not need the processed versions with all their additives to get a ranch flavor. 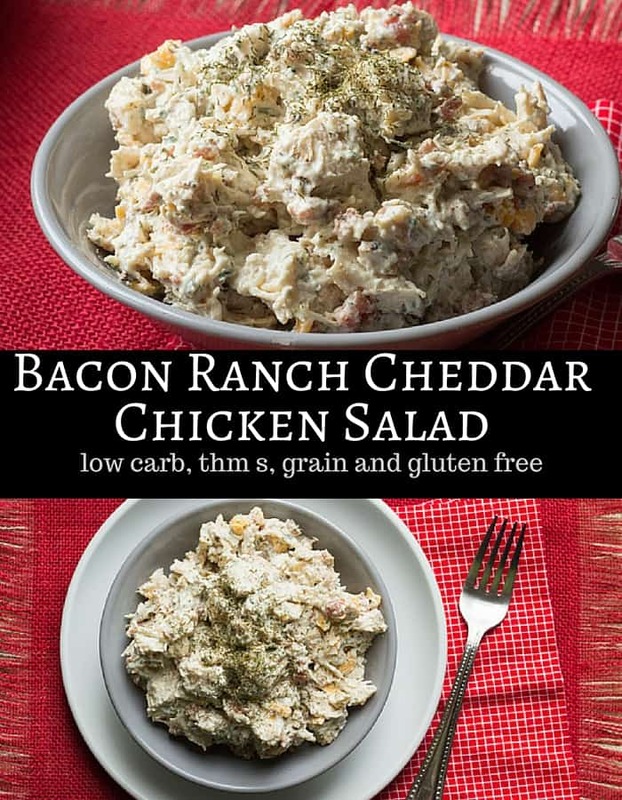 My Bacon Ranch Easy Chicken Salad is bursting with flavor. It is rich and creamy with cheddar, bacon, and dill. This is the BEST chicken salad you will ever eat. 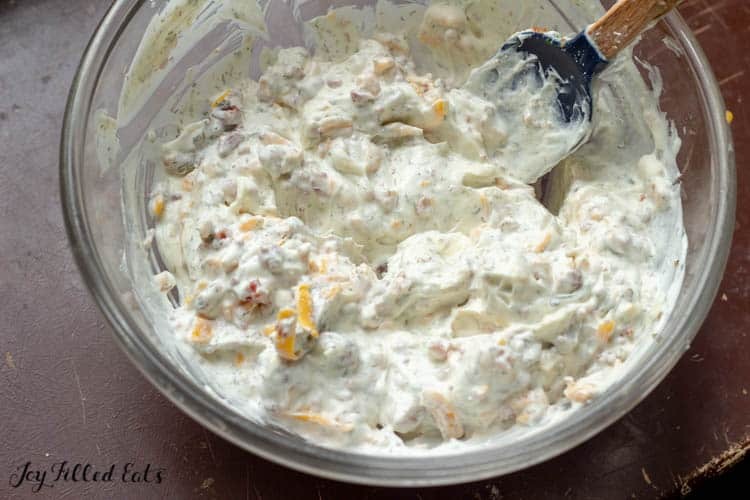 Combine mayo, sour cream, and spices and mix thoroughly. Fold in the chicken, bacon, and cheddar. Originally published May 20, 2016, Revised and republished December 14, 2018. Very nice recipe! I don't really like chicken salad but this is making me think again. I made a couple of small change, I used 1.5 ounce of softened cream cheese instead of mayo as I don't like mayo(makes everything too wet). Refrigerated overnight, this is the perfect texture I prefer and tastes delicious. I added way more fresh dill fronds as I love dill! Thanks for the recipe! Do you think it would be okay to do an 1/8c cream cheese and 1/8c sour cream? Not a huge fan of sour cream. Taryn, what kind of mayo and sour cream do you use? I like the Just Mayo brand of mayo and I just use the store brand of sour cream or whatever is on sale. Hello Taryn, just came across your site and really like it. I was wondering if you could add measurements in grams/ml for us Europeans who don't do/understand cups and find measuring in grams/ml more accurate? Thank you! Hi Margaret, I've been meaning to look into adding that information. Thanks for the reminder! This is amazing! And totally kept. Thank you for sharing! I put in a little more cheese and bacon and I also sautéed the chicken a little in the bacon grease for a little extra flavor. Delicious!Upped the chicken to 15 oz. I used 4 tbsp mayo, 3 tbsp home made ranch dressing and I did not have sour cream so I replaced it with 3 tbsp of sabra tzatziki dip and it tasted great! Is the 552 calories for both servings or just one? That is just for one serving. The bacon, cheese, and mayo pump up the calories a bit. If you want to reduce them you could cut back on the bacon & cheese and add a little plain yogurt in place of part of the mayo. Is it dill seed or dill weed? Oh My Goodness, this was sooooo delish. I used three precooked grilled chicken breast from HEB. I also added some scallions/green onions. Adding this to my regular menu. How many servings is this? I was thinking four? I have the nutrition facts calculated for 2 servings. If you put a scoop on top of a green salad it could stretch to 3 or 4 servings. Have you tried adding small cubes of Jicima. It would add a subtle sweetness and a crunch. Love Jicima. Low carb and crunchy. No, I'm not a big jicama fan. It's too similar to water chestnuts which I always picked out of Chinese food as a child. Lol. 1 cup of jicama has 5 net carbs so it is fairly low carb. Adding a little for crunch isn't a bad idea, although celery may be a better option depending on your diet plan. so this is an S meal?